Soybean is an important source of edible vegetable oil and protein throughout the world and is used in a multitude of food and industrial applications. Even though soybeans are a rich source of protein for livestock and humans, the nutritional quality of soybean proteins is not optimal. Some of the problems associated with soybean proteins include (1) presence of anti-nutritional factors such as trypsin inhibitor, (2) undesirable beany flavor, (3) elicitation of allergic reactions in susceptible individuals (4) poor digestibility of soybean proteins, and (5) deficiency in sulfur-containing amino acids. The goal of our research program is to improve the overall quality of soybean seed composition by molecular biological approaches. Another area of our research is focused on biological nitrogen fixation using the model symbiosis between soybeans and Sinorhizobium frediiUSDA257. Efficient nitrogen fixation greatly enhances the yield of protein-rich seeds. Our research is focused on the molecular basis of host specificity using the model symbiosis between soybeans and S. fredii USDA257. This strain nodulates primitive but not agronomically improved soybean cultivars. Our laboratory is currently focusing on the cultivar-specificity genes of S. fredii. What do they encode? What regulates their expression? And how are the responses are made host specific? Answers to such questions will enable us to rationally manage and enhance the process of biological nitrogen fixation and improve the overall soybean protein quality. Krishnan HB, Natarajan SS, Bennett JO, Sicher RC. Protein and metabolite composition of xylem sap from field-grown soybeans (Glycine max) Planta 2011;233(5):921-931. Liu R, Krishnan HB, Xue W, Liu C. Characterization of allergens isolated from the freshwater fish blunt snout bream (Megalobrama amblycephala). Journal of Agricultural and Food Chemistry 2011;59(1):458-463. Yang S, Tang F, Gao M, Krishnan HB, Zhu H. R gene-controlled host specificity in the legume-rhizobia symbiosis. Proceedings of the National Academy of Sciences of the United States of America 2010;107 (43):18735-18740. Yi H, Ravilious GE, Galant A, Krishnan HB, Jez JM. From sulfur to homoglutathione: Thiol metabolism in soybean. Amino Acids 2010;39 (4):963-978. Kim WS, Krishnan HB. The lack of beta-amylase activity in soybean cultivar altona sp 1 is associated with a 1.2 kb deletion in the 5' region of beta-amylase I gene. Crop Science 2010;50(5):1942-1949. Krishnan HB, Kerley MS, Allee GL, Jang S, Kim WS, Fu CJ. Maize 27 kDa ?-Zein is a potential allergen for early weaned pigs. Journal of Agricultural and Food Chemistry 2010;58(12):7323-7328. Schechter LM, Guenther J, Olcay EA, Jang S, Krishnan HB. Translocation of NopP by sinorhizobium fredii USDA257 into vigna unguiculata root nodules. Applied and Environmental Microbiology 2010;76 (11), pp. 3758-3761. Schroeder AC, Zhu C, Rao Yanamadala S, Cahoon RE, Arkus KAJ, Wachsstock L, Bleeke J, Krishnan HB, Jez JM. Threonine-insensitive homoserine dehydrogenase from soybean: Genomic organization, kinetic mechanism, and in vivo activity. Journal of Biological Chemistry 2010;285 (2), pp. 827-834. Krishnan HB, Natarajan SS.A rapid method for depletion of Rubisco from soybean (Glycine max) leaf for proteomic analysis of lower abundance proteins. Phytochemistry 2009;70 (17-18), pp. 1958-1964. Ko HS, Jin RD, Krishnan HB, Lee SB, Kim KY. Biocontrol ability of lysobacter antibioticus HS124 against phytophthora blight is mediated by the production of 4-hydroxyphenylacetic acid and several lytic enzymes. Current Microbiology 2009;59(6):608-615. Cummings SP, Gyaneshwar P, Vinuesa P, Farruggia FT, Andrews M, Humphry D, Elliott GN, Nelson A, Orr C, Pettitt D, Shah GR, Santos SR, Krishnan HB, Odee D, Moreira FMS, Sprent JI, Young JPW, and James EK. Nodulation of Sesbania species by Rhizobium (Agrobacterium) strain IRBG74 and other rhizobia. Environmental Microbiology 2009;11:2510-2525. Ko HS, Jin RD, Krishnan HB, Lee SB, Kim KY. Biocontrol ability of Lysobacter antibioticus HS124 against Phytophthora blight is mediated by the production of 4-hydroxyphenylacetic acid and several lytic enzymes. Current Microbiology 2009; 1-8. Natarajan SS, Krishnan HB, Lakshman S, and Garrett WM. An efficient extraction method to enhance analysis of low abundant proteins from soybean seed. Analytical Biochemistry 2009;394:259-268. 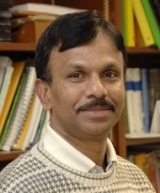 Krishnan HB. Preparative procedures markedly influence the appearance and structural integrity of protein storage vacuoles in soybean seeds. J. Agric. Food Chem. 2008;56:2907-12. Krishnan HB, and Chronis D. Functional nodFE genes are present in Sinorhizobium sp. strain MUS10, a symbiont of the tropical legume Sesbania rostrata. Applied and Environmental Microbiology 2008;74:2921-23. Han SH, Kim CH, Lee JH, Park JY, Cho SM, Park SK, Kim KY, Krishnan HB, and Kim Y C. Inactivation of pqq genes of Enterobacter intermedium 60-2G reduces antifungal activity and induction of systemic resistance. FEMS Microbiology Letters 2008;282:140-46. Bilyeu KD, Zeng P, Coello P, Zhang ZJ, Krishnan HB, Bailey A, Beuselinck PR, and Polacco JC. Quantitative conversion of phytate to inorganic phosphorus in soybean seeds expressing a bacterial phytase. Plant Physiology 2008;146:468-77. Mahmoud AA, Sukumar S, and Krishnan HB. Interspecific rice hybrid of Oryza sativa x Oryza nivara reveals a significant increase in seed protein content. J. Agric. Food Chem. 2008;56:476-82. Phartiyal P, Kim WS, Cahoon RE, Jez JM, and Krishnan HB. The role of 5'-adenylylsulfate reductase in the sulfur assimilation pathway of soybean: molecular cloning, kinetic characterization, and gene expression. Phytochemistry 2008;69:356-364. Krishnan HB, Kang BR, Krishnan AH, Kim KY, and Kim YC. Rhizobium etli USDA9032 engineered to produce a phenazine antibiotic inhibits the growth of fungal pathogens but is impaired in symbiotic performance. Applied and Environmental Microbiology 2007;73:327-30. Fu CJ, Jez JM, Kerley MS, Allee GL, and Krishnan HB. Identification, characterization, epitope mapping, and three dimensional modeling of the ?-subunit of ?-conglycinin of soybean, a potential allergen for young pigs. J. Agric. Food Chem. 2007;55: 4014-4020. Krishnan HB, Kim WS, and Hyung JS. Calcium regulates the production of nodulation outer proteins (Nops) and precludes pili formation by Sinorhizobium fredii USDA257, a soybean symbiont. FEMS Microbiol. Lett. 2007;271: 59-64. Krishnan HB, Natarajan SS, Mahmoud AA, and Nelson RL. Identification of glycinin and ?-conglycinin subunits that contribute to the increased protein content of high-protein soybean lines. J. Agric. Food Chem. 2007;55:1839-1845. Krishnan HB, Kang BR, Krishnan AH, Kim KY, and Kim YC. Rhizobium etli USDA 9032 engineered to produce a phenazine antibiotic inhibits the growth of fungal pathogens but is impaired in symbiotic performance. Appl. Environ. Microbiol. 2007;73:327-330. Yoshida K, Kim WS, Kinehara M, Mukai R, Ashida H, Ikeda H, Fujita Y, and Krishnan HB. Identification of a functional 2-keto-myo-insositol dehydratase gene of Sinorhizobium fredii USDA191 required for myo-inositol utilization. Biosci. Biotechnol. Biochem. 2006;70: 2957-2964. Krishnan HB, Natarajan SS, Mahmoud AA, Bennett JO, Hari Krishnan A, and Prasad BN. Assessment of indigenous Nepalese soybean as a potential germplasm resource for improvement of protein in North American cultivars. J. Agric. Food Chem. 2006;54: 5489-5497. Lorio JC, Chronis D, and Krishnan HB. y4xP, an open reading frame located in a type III protein secretion system locus of Sinorhizobium fredii USDA257 and USDA191, encodes cysteine Synthase. Mol. Plant-Microbe Interact. 2006;19: 635-643. Phartiyal P, Kim WS, Cahoon RE, Jez JM, and Krishnan HB. Soybean ATP sulfurylase, a homodimeric enzyme involved in sulfur assimilation, is abundantly expressed in roots and induced by cold treatment. Arch. Biochim. Biophys. 2006;450: 20-29. Mahmoud AA, Natarajan SS, Bennett JO, Mawhinney TP, Wiebold WJ, and Krishnan HB. Effect of six decades of selective breeding on soybean protein composition and quality: A biochemical and molecular analysis. J. Agric. Food Chem. 2006;54:3916-3922. Krishnan HB, Bennett JO, Kim WS, Krishnan AH, and Mawhinney TP. Nitrogen lowers the sulfur amino acid content of soybean (Glycine max [L.] Merr.) by regulating the accumulation of Bowman-Birk protease inhibitor. J. Agric. Food Chem. 2005;53: 6347-6354. Kim WS, Sun-Hyung J, Park RD, Kim KY, and HB Krishnan. Sinorhizobium fredii USDA257 releases a 22-kDa outer membrane protein (Omp22) to the extracellular milieu when grown in calcium-limiting conditions. Molecular Plant-Microbe Interactions 2005;18: 808-818. Deakin WJ, Marie C, Saad MM, Krishnan HB, and Broughton WJ. NopA is associated with cell surface appendages produced by the type III secretion system of Rhizobium species NGR234. Molecular Plant-Microbe Interactions 2005;18:499-507. Kim WS, Kim J, Krishnan HB, and Nahm BH. Expression of Escherichia colibranching enzyme in caryopsis of transgenic rice results in amylopectin with an increased degree of branching. Planta 2005; 220: 689-695. Krishnan HB. Engineering soybean for enhanced sulfur amino acid content. Crop Sci. 2005;45: 454-461.